A Customer Rates grid is presented where you can enter the work codes and rates. You can also get to this grid by pressing [Ctrl]-[R] from either the job order screen or the customer screen – or by choosing the [Rates] button from the customer rates screen or job order screen. When you use the button or [Ctrl]-[R] method, the customer you were working on in the job order or customer screen is automatically selected in the customer rates screen. In addition to the work code, pay rate, bill rate, and OT bill rate fields, a comment field is available for making appropriate notations – like instructions to users about when to use a given rate. 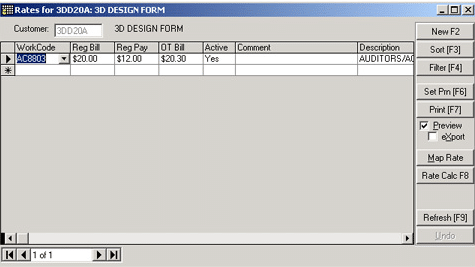 The description of the work code is displayed in the grid, but this is a read-only column presented for informational use. When entering or changing a bill rate in the grid, the OT bill rate field is automatically updated based on the default OT Bill factor for the customer. This is merely for convenience. The OT bill rate can be edited to something other than the default. An “Active” field is also available so that customer rates can be maintained ahead of time in anticipation of a price adjustment, or, in anticipation of implementing an initial rate structure for a customer. By default, the Active column is set to “yes” when you enter a new rate line. To make a rate inactive, just choose “No” in the active field. Only active rates are presented to users during placement setup. If all the rate lines for a given customer are inactive, Temps Plus treats the customer as if no rate structure were in place. When moving a rate record from active to inactive you are offered the opportunity to close all open placements with that rate record. When you change the work code, bill rate or pay rate on an active Customer Rate record, an option is given to update all active placements that had the old information to the new information. When you delete an active customer rate record, an option is given to close all active placements that matched the deleted rate record.